Shipping costs apply to all orders. 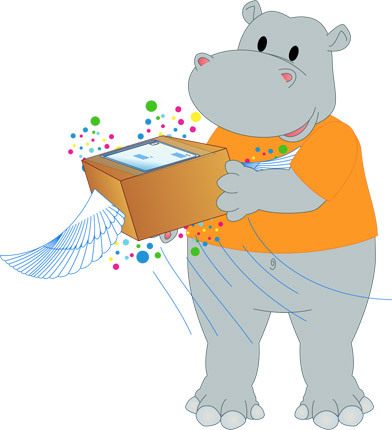 If ordering from outside of Canada, please email us at information@hipporay.com, or call us at 450-442-4212 and we will gladly provide a quote. * You may add up to 2 Journals or Educational Tools without incurring additional shipping costs when the items are shipped in an Activity Box. * For example, if you order three educational tool sets and one calendar, you will pay shipping costs of $4.00 + $2.00 + $1.00 + $1.00 = $8.00 for the 4 products. On the other hand, it’s possible to add up to 2 tools without additional shipping costs when they are shipped with an Activity Box. Unless otherwise specified, all products are shipped through Canada Post’s “Expedited Parcel” service, which means that the delivery of your product takes around 2 to 4 days (in Quebec). For delivery outside of Quebec, the period is slightly longer, but doesn’t generally take more than 4 to 7 days. You will receive an email notification when you order is shipped. In the event that one of the products you ordered is out of stock, you may receive your products separately. In this case, we will assume additional shipping costs caused by this delay. We always strive to ensure the ordered merchandise is delivered as fast as possible.